Mr. Hogan is Phillips Lytle’s Managing Partner, having previously served as its Trial Department Administrator and Environment Practice Team Leader. He concentrates his practice in the areas of environmental law, intellectual property and litigation. An effective and efficient legal advisor, he counsels clients on environmental compliance at both the state and federal levels with respect to investigations and enforcement proceedings by state and federal agencies, and on environmental issues arising in corporate and commercial transactions. 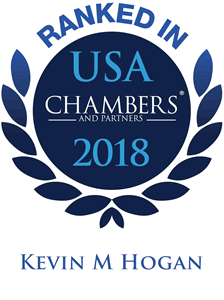 An experienced litigator with a track record of successfully resolving disputes, Mr. Hogan defends clients in environmental cost recovery claims, toxic exposure lawsuits, and engineering and professional malpractice claims. He also represents clients in disputes involving patents, licenses, trademarks and other intellectual property. Mr. Hogan is a skilled negotiator who also serves as a court-designated mediator in the Western District of New York. Litigation – Represent clients in state and federal court and before administrative panels and arbitration tribunals, in enforcement proceedings and cost recovery actions brought by EPA and DEC, and in citizen suits and private cost recovery claims, commenced under CERCLA, RCRA, CWA, and the New York Oil Spill Act. Assist clients in defending and challenging SEQR decisions pursuant to Article 78 of the New York Civil Practice Law and Rules. Environmental Transactional Due Diligence – Counsel clients involved in transactions, both purchasers and sellers, on potential liabilities identified in Phase I and Phase II Environmental Site Assessments, Regulatory Compliance Audits, and Asbestos, Lead Paint, Vapor Intrusion, and Mold Assessments. Assist clients in analyzing CERCLA All Appropriate Inquiries defenses and potential successor liabilities. Clients include publicly-held corporations, private and family-owned businesses, lenders, developers, property owners, and commercial landlords and tenants. Solid and Hazardous Waste – Counsel clients on management of solid and hazardous waste to comply with federal and state statutes and regulations. Represent clients in state and federal administrative enforcement actions and voluntary remedial programs. Assist clients in the preparation and submittal of Beneficial Use Determination petitions to the New York State Department of Environmental Conservation for the beneficial reuse of solid waste materials. Counsel clients on potential liabilities associated with asbestos, lead-based paint, and PCBs. Underground Storage Tank Regulations – Counsel clients on compliance with federal and state underground storage tank regulations, including registration, overfill protection, release detection, inventory monitoring, and testing requirements. Advise clients on potential liabilities associated with redevelopment of gasoline stations and other sites with existing and removed underground storage tanks. New York State Brownfield Cleanup Program – Counsel clients on the benefits of participating in the Brownfield Cleanup Program, including liability release and tax credits. Assist clients in the preparation of applications for participation in the Brownfield Cleanup Program. Participate in meetings with the New York State Department of Environmental Conservation to discuss application requirements, citizen participation, brownfield agreements, remedial investigation work plan, and remedy selection. Regulatory Takings – Assist clients in preparing potential takings claims under the Fifth Amendment for litigation.